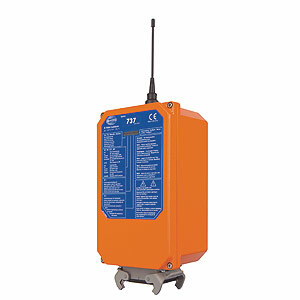 The Plug and Play receiver for chain hoists. 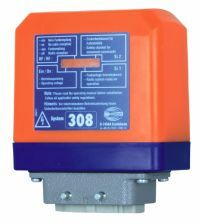 Integrated signal lamp for indication of crane operation. Power supply 24Vac of 48-240Vac. Inteligent Frequency Management (2.4GHz or DECT technology. 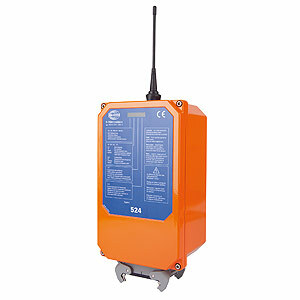 Plug & play radio technology for chain hoists. The Ideal Receiver for Single-Step Drives! 24 – 48 V AC, 10 – 30 V DC. Suitable for Multi Receiver Concepts (MRC). Emergency-stop: category 3 according to EN 954-1. Dimensions: 145 x 145 x 72 mm (5.7“ x 5.7“ x 2.8“). Weight: approx. 1 kg (2.2 lbs.). The Versatile Radio Receiver with CAN interface! 8 additional black / white outputs. 10 – 30 V DC. The Versatile Radio Receiver for DC applications! 12 Relay-Outputs, 8 additional digital outputs. Feedback capability via 4 optocouplers. Clutch – Break interlock switchable. Emergency-stop: category 3 (EN 954-1). Plug-in connection: cable glands or Harting plug. 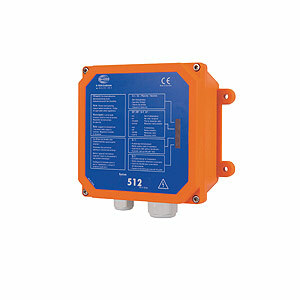 Power supply: 10 – 30 V DC. Clever mounting device for easy installation. An Attractively-Priced Quality Receiver for the Control of 3 Two-Step Drives! 12 commands black/white + emergency-stop + infrared relay. Frequency ranges: 400 – 475 MHz, 868 – 928 MHz. Dimensions: 165 x 165 x 70 mm (6.5 x 6.5 x 2.7“). Connection: cable glands or Harting plug (optional). 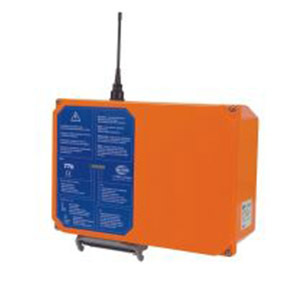 Power supply: 42 – 240 V AC (worldwide capabilities). Mounting device for easy installation. Best Quality for the Control of Standard Industrial Cranes! 16 commands black / white + emergency-stop + infrared relay. Control of 1 analog function possible (e. g. analog long travel). 902 – 928 MHz (country-specific frequencies available on request). 3.5 kg (approx. 7.7 lbs.) with aluminum housing. Connection: Han 32 or cable glands. (Automatic Frequency Selection), radiomatic® infrakey. 24 black/white commands + emergency-stop. 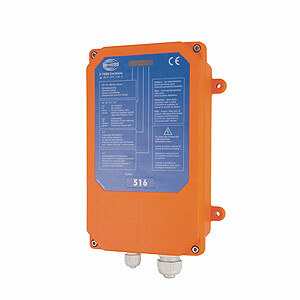 Robust housing of protection class IP 65. Dimensions: 270 x 160 x 115 mm (10.6” x 6.3” x 4.5”). Weight: 3.5 kg (approx. 7.7 lbs.). Connection: Han 32, Han 50 or cable glands. 15 – 30 V DC. Great Versatility in a Compact Design! flexcard modular system for customer-specific configuration. Control of up to 8 analog functions. Feedback capability (digital, analog or serial). Emergency-stop: category 4 according to EN 954-1. Dimensions: 165 x 165 x 115 mm (6.5 x 6.5 x 4.5 inches). 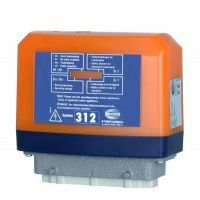 Power supply: 42 – 240 V AC (universal capabilities). Best Quality for Mobile Applications! Up to 18 commands black/white. Profi bus-DP, RS232 and RS485. Teachable and reversible speed presets. Dither signal for exceptionally precise control. Electronic error detection/short circuit protection. Weight: approx. 2.6 kg (5.7 lbs.). Options: radiomatic® AFS, radiomatic® AFM, cable control. 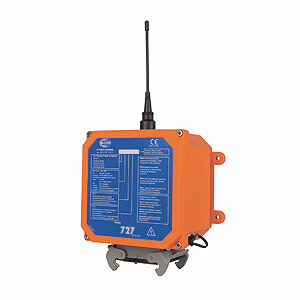 Tailor-Made Radio Technology for the Control of Cranes & Machinery! contacts) plus 8 analog commands. Robust aluminum housing, protection class IP 65. Dimensions: 270 x 160 x 115 mm (10.6 x 6.3 x 4.5 inches). Weight: 3.5 kg (7.7 lbs.). Connection: Han 32 or Han 50. Power supply: 42 – 115 V AC, 100 – 240 V AC. Flexcard module system for customer-specific settings. Control of up to 10 proportional functions. 44 black/white commands without proportional commands). Suitable for all common proportional valves. Teach-in enabled and reversible preset speeds. 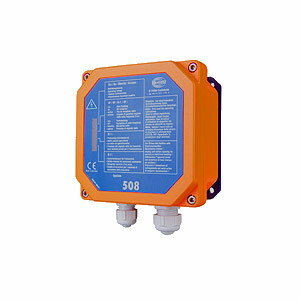 Dither signal for highly sensitive control of the crane or machine. Electronic error detection and electronic short circuit protection. Frequency ranges: 400 – 475 MHz, 868 – 928 MHz.·Robust plastic housing, protection class IP 65. Dimensions: 270 x 160 x 115 mm (10.6“ x 6.3“ x 4.5“). The receiver for large industrial applications! Additionally, up to 100 black/white commands. Dimensions: 360 x 260 x 115 mm (14.2“ x 10.2“ x 4.5“). Connection: 2* Han 32, Han 50 or Han 64. Power supply: 42-115 or 100-240 Vac. 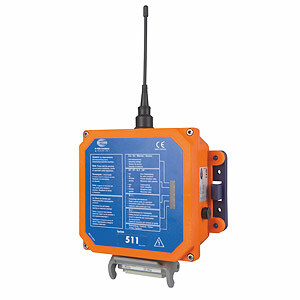 The receiver for large mobile applications! Connection: 2* Han 32 or Han 50 or Han 64. © 2012 Custom Controls Inc. All rights Reserved.